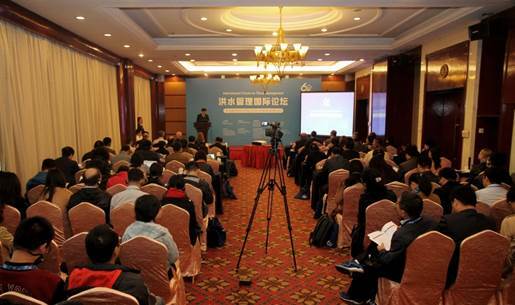 On October 19, 2018, the International Forum on Flood Management, sponsored by the Ministry of Water Resources (MWR) and the International Conference on Flood Management (ICFM) and organized by China Institute of Water Resources and Hydropower Research (IWHR), was held in Beijing. 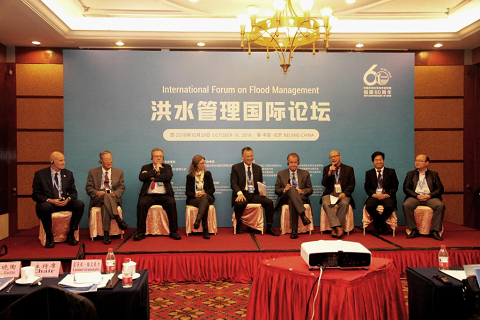 The theme of this forum was “Integrated Flood Risk Management in a Changing Environment”. More than 100 experts and scholars from the field of flood control and disaster reduction at home and abroad attended the forum. 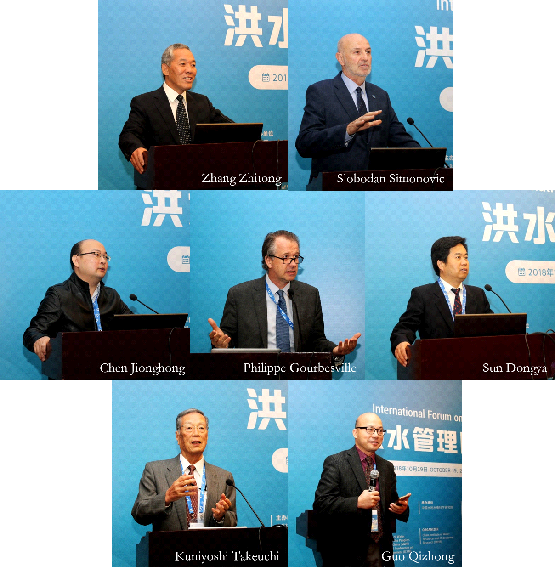 Prof. Zhang Zhitong, former Chief Planner of MWR, attended the forum and made a keynote speech. Prof. Liu Zhiping, former Vice President of IWHR, attended the forum and gave a welcome speech. Prof. Slobodan Simonovic, Chairman of ICFM, among others, delivered keynote speeches. Co-chaired by Prof. Cheng Xiaotao from IWHR and Ms. Louise Grondahl, Senior Consultant at the Danish Environmental Protection Agency of the Ministry of Environment and Food of Denmark, the forum centered around such topics as “Integrated Flood Risk Management in the New Era”, “Real-time Joint Operation in River Basin Flood Control”, “Forecasting and Warning of Floods in Small and Medium-sized Rivers”, “Monitoring and Warning of Mountain Flood Disasters”, “Climate Change and Urban Storm Flood Management” and “Public Involvement in Flood Control and Disaster Reduction”. Prof. Zhang Zhitong and Prof. Slobodan Simonovic respectively delivered keynote speeches on “Implementing Flood Risk Management is the Key to Flood Prevention” and “Flood Management: from Risk to Resilience-A New Way to Assess the Adaptability of Flood Management Measures in A Changing Environment”. Prof. Chen Jionghong from the Office of Flood Control and Drought Relief of Changjiang Water Resources Commission, Prof. Philippe Gourbesville, Vice Chairman of the Asia Water Council (AWC), Prof. Sun Dongya from the Research Center on Flood and Drought Disaster Reduction of IWHR, Kuniyoshi Takeuchi, Honorary Professor from the University of Yamanashi, and Prof. Guo Qizhong from the State University of New Jersey, among others, delivered keynote speeches on “Practices and Implications of Joint Flood Control Operation in Controlled Reservoirs in the Yangtze River Basin”, “Flood Management: Challenges and Expectations for Smart Solutions”, “Monitoring and Warning of Mountain Flood Disasters in China”, “Flood Management in Japan”, and “Urban Waterlogging Management in the US”. In the expert discussion session, Prof. Nobuyuki Tamai, former President of the International Association for Hydro-Environment Engineering and Research (IAHR), Ms. Louise Grondahl, Dr. Jerome Priscoli, Chair of the Global Water Partnership Technical Committee, Prof. James Ball, Vice President of IAHR, and Prof. Lin Bingzhang from Nanjing University of Information Science and Technology expressed their views on the theme and the topics. How to deal with the impact of floods on sustainable economic and social development in the future is a challenge for all of us. At the forum, experts focused on the theme and shared new concepts, methods, technologies and successful cases in international flood control, deepened their understanding and consensus on the connotation of flood management, and promoted international academic exchanges and mutual learning.